Jamie Fitzpatrick (Maggie Gyllenhaal) has a dyslexic daughter who is not getting the proper education or attention from the complacent teachers at her local public school. She asks to have her daughter transferred to the class of Nona Albert (Viola Davis), but the administration will not allow it. This school has been rated with an "F" for many years. In an effort to make the school better for their kids, Jamie and Nona use a little known law that will allow them to appeal to the school board to essentially take over the failing Adams elementary school. They quickly realize this is an uphill battle and must overcome a mountain of bureaucracy and a mud-slinging teacher's union to do it. This film certainly has an agenda and is not subtle about it. The goal of it is very similar to the documentary "Waiting for Superman," in that public schools in general are barely getting by and that unions only serve to protect the incompetent. Alternatively, charter schools with non-union teachers are the blanket solution to this epidemic. 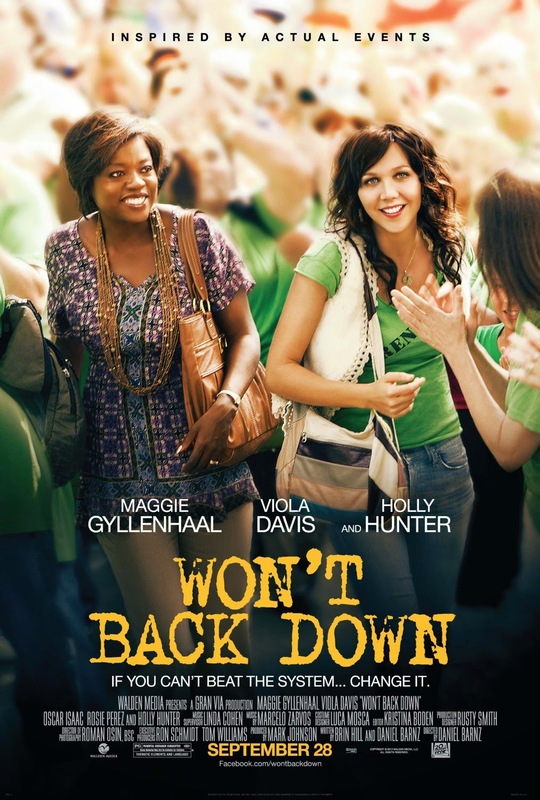 "Won't Back Down" doesn't explore any gray areas at all. Malia's teacher is portrayed as not only indifferent to her individual struggles, but is also downright mean and hateful towards both her and her mother, too. The principal, played by Bill Nunn, doesn't seem concerned whether or not the students of his school pass or fail, and even then, he only does the minimum amount of work necessary to get paid. He seems to only have sympathy for the incompetent teachers who contribute to his school's failure. The teachers union has been turned into the villain of this movie, showing that it is only concerned with money and protecting the jobs of those who should be fired. It also makes clear that if believes no teacher should ever have to work past the end of the school day. To us, this is not a full representation of how it always is when dealing with public schools. Sure, there are school exactly like this in the country, but it doesn't bring to light the true root of the issue, which does way beyond bad teachers and poor administration. The film itself does a fantastic job trying to rile up emotions within its viewers to its cause and we do feel sympathetic for Malia, as well as Jamie and her frustration with all of the bureaucracy she has to deal with to get her kid a decent education. We really do hate Malia's teacher, and if I ever had a kid that had a teacher like that, I'd slug that teacher and not feel bad about it. This film involves a touchy subject for BigJ, as his mother was a public school teacher for over 25 years in a lower income area of the city. Despite being a member of a union, she often stayed after school and always brought her papers home to create lesson plans during the weekend and during her vacation time. Her day never truly ended at 3:00 with the sound of the bell. She truly worked for her kids and cared about them all equally. She was a tough teacher, pushing her kids to be and do their best. Yes, there are bad teacher out there in the country and there are probably some that deserve to get fired, too, but this movie is definitely too one-sided without showing any in between. There are no questions, there are no concerns as to whether or not the characters in the film are making the right choices by attempting to start a charter school on their own. Education reform is a touchy subject to say the least, and this movie just doesn't cut it. Even with a tremendous cast who performs well, it just isn't informed enough to make an unbiased, not glorified film all while coming off as overly preachy to boot.